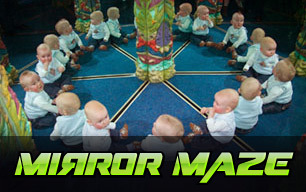 OdySea Mirror Maze - Be Amazed. Be Amused. OdySea Mirror Maze is a challenging adventure for the body and mind. By surrounding your pathways with mirrors you see infinite reflections, impossible corridors and mind-bending light effects. It's an experience like no other! Get lost as you try to find your way through a maze of jungle, mirrors, false passages and an ancient Mayan Temple. 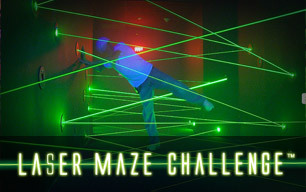 Designed to be an updated high-tech version of a classic maze, the laser maze challenges participants to twist, turn and duck through various beams with a goal to touch "mission buttons" while avoiding lasers. 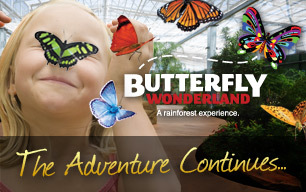 The perfect fun and unique place to hold your next birthday party, field trip, company meeting or group outing! Mirror mazes are challenging adventures for the body and mind. By surrounding your pathways with mirrors you see infinite reflections, impossible corridors and mind-bending light effects. Imagine entering a dark room and a web of lasers pops to life right in front of your eyes. Your mission, should you choose to accept it, is to navigate through the puzzle of lasers as quickly as possible.